TDS Miguel and E's Holly both new arrivals from the track and were adopted together by Christa and Kim in Lebanon the day after meeting them at Dr. Moore's office right after surgery. 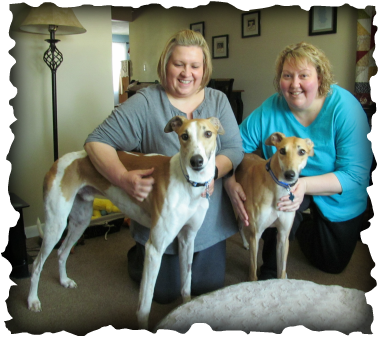 The sisters came to the Valentine Event to talk to our families about greyhounds. What a perfect fit, these two hounds are already good friends. They came home to new beds and toys. These pups are going to be spoiled rotten. Timing is everything!I'm sure we'll see this family often at future events.